The New York Federal Reserve is choosing the second most influential monetary policymaking position in the country -- arguably the most powerful position in the U.S. that President Trump will not appoint. The next NY Fed President could be our last line of defense against another devastating financial crash, or they could let another one happen. That’s why, on March 12, ten years after one of the worst economic recessions in American history, a coalition of working families, labor leaders, and community organizations, led by CPD’s Fed Up coalition, gathered on Wall Street to tell the NY Fed that they can’t afford another crash. 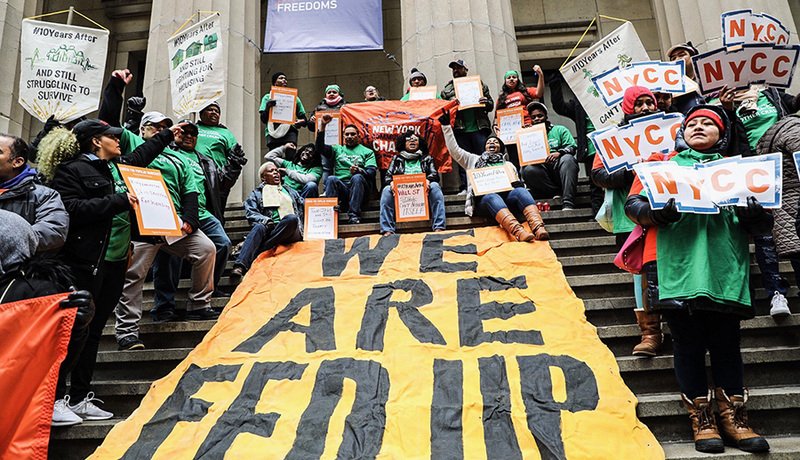 This action marked the launch of the campaign’s ambitious effort at membership development and popular education, and called on the NY Fed to resist turning to Wall Street in its search for its next president. Using a report titled 10 Years After: the Financial Crisis and the New York Federal Reserve, Fed Up showed the extent of those consequences, examining the lasting impact of the crash in the NY Fed district, finding that more people in the NY Fed district live in poverty today than before the financial crash, while the top one percent of earners have captured a greater share of income. On March 12, with this context, CPD affiliates SPACES, NYCC, Action NC, Our Walmart, One PA, New Georgia Project, Taller Salud and MORE, joined New Economy Project and New Yorkers still recovering from the 2008 financial crisis, including those who lost homes and jobs, to demand the NY Fed prioritize working people over Wall Street interests with its next appointment. In 2008, when the entire financial system was melting down, the NY Fed met behind closed doors to funnel billions to the big banks. Ten years later, the banks are more profitable than ever, but New Yorkers are still living with the consequences. This week, news broke that San Francisco Fed President John Williams is the frontrunner to become the next NY Fed President -- another white, male, hawkish Wall Street insider. Just days after the announcement, the Fed Up campaign quickly organized resulting in Senator Cory Booker weighing in with an op-ed in Bloomberg, Senator Warren calling for federal hearings on the process, the New York Times calling the process into question, and the Wall Street Journal noting that there was a "degree of public criticism rarely seen in the relatively obscure world of regional central bank chiefs." Following the public support, Fed Up released an unprecedented compilation of opposition to the NY Fed's process and appointment that included statements from Senator Kirstin Gillibrand, Mayor Bill DeBlasio, 17 members of the New York City Council, 35 local upstate officials, the City Comptroller Stringer, State Comptroller DiNapoli, and four public representatives from within the Federal Reserve system. Reuters described it as "extraordinary public opposition" and Bloomberg described "intense scrutiny from city hall to Capitol Hill." The Federal Reserve has never seen anything like this -- and it isn't over yet. Take action today and tell the NY Fed to start the process over, listen to the public and appoint a zealous advocate for full employment and a tenacious regulator as president of the New York Fed!